Cloud to cloud migration free tool MultCloud enables you to directly migrate files from one cloud drive to another without taking local storage as a transit and ensuring data security. Why need to migrate files directly from one cloud drive to another? It is much easier, quicker as well as safer. Otherwise, you have to first of all download the target files from cloud drive storage to local storage devices such as computer internal hard disks, USB flash drive, PenDrive, SanDisk, NAS (Network Attached Storage), etc. Then, upload these files from local to destination cloud drive. This is boring and time-wasting. Moreover, what if there is no enough local storage space for the large amount of data you are going to migrate? To buy extra hard disks is expensive. And, to transfer those files in several times is troublesome; you have to wait the former transfer finishes to start the next one (which means that you have to stay in front of your computer until all migrations finish). Therefore, is there an easier and quicker way to do cloud to cloud migration, like directly cloud to cloud data migration? Yes, there is like exactly what you wish. Yet, we have to ask help from a third party software for there is no such service provided by cloud drive. Different cloud drives now are in competitive relationship instead of cooperation; maybe there will be in the future. Then, it will have some benefits for cloud drive storage users like you and me. Just as mentioned above, to migrate from cloud to cloud, you need help from third party programs. Among these programs, many requires you to pay for its service while few are free of charge like MultCloud. MultCloud is one of the cloud to cloud migration free tools and is an excellent one among all charged and free cloud drive management applications. With MultCloud, you can easily and quickly migrate files/folders, photos/pictures/videos, documentaries/sheets, etc. data directly from your one cloud account to another without losing data. For example, migrate files from Google Drive to Dropbox. As for how much time it costs, it depends on how much data you transfer. In general, to migrate data from one cloud directory to another, you have to first create a free account of MultCloud, then add both of your cloud drive accounts (they can belong to different cloud brands or same cloud brand) to MultCloud, and finally carry out file migration between clouds. In its official website, you can get account creation entrance everywhere. In each page, you can see “Sign up” on top right or bottom left. Especially, in its home page, you can create an account through the banner entrance. Or, you can directly create an account in sign up page. Especially, there is a kind of account which do not need user to sign up with their personal information. It is “Experience without signing up” under “Sign up” button on top right of every page or on the banner of home page. This is a temporary account for you to experience the functions of MultCloud. If you have some doubts about MultCloud, just make use of this account to have a try. When you are convinced by it, then you can continue to create a real account. After you have an account of MultCloud, either temporary or private, you can then add your related cloud drive storage accounts into MultCloud platform. Sign in your MultCloud account, in its main window, click on “Add Clouds” tab on the top and then choose one of the cloud you want to add (here take Google Drive as an example). Then, just follow the guidance to finish add cloud drives task. Add your other cloud accounts just as above steps. When both source cloud and destination cloud are added into MultCloud, you can begin files movement between two cloud drives. 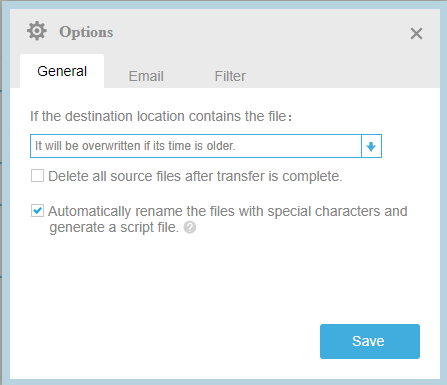 Choose “Cloud Transfer” in MultCloud main interface. Then, in the next screen, specify source and target cloud directory. As you can see, you have “Options” in the lower left for your choice. In it, you can specify how it deals with if the destination location contains the migrating files, overwrite, skip or rename. Tick “Delete all source files after transfer is complete” if you want to clear transferred files in source drive after migration. Or, you can keep it unchecked and manually delete these files after migration and confirming that all files are successfully saved to target location. You can order email notification when the task finishes. You can also filter files with certain file format during migration. Schedule feature is also useful if you want regularly files transfer between the two cloud directories. 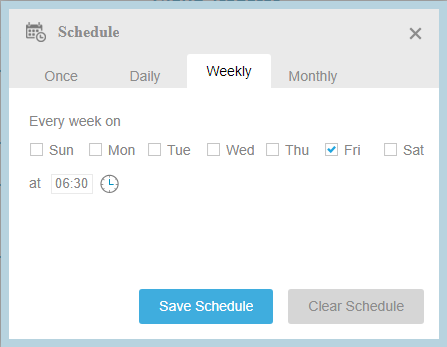 A set time of a day of daily, weekly or monthly is available. After migration, you can see the target files in target location on “Cloud Explorer” tab. Or, you can just go to target cloud web page, sign in your cloud account and see whether there are the target files or not. Just give it a few minutes before checking the files in destination if the target files are in large amount. If you still can’t see target files in destination, just refresh your browser and you will see them. Use above method, you can do same cloud brand migration, different cloud brand migration, private cloud to public cloud migration, etc.